With all that is going on in the Gulf right now with this BP disaster, many of us feel angry and powerless as to what we can do to make a positive impact on the environment. 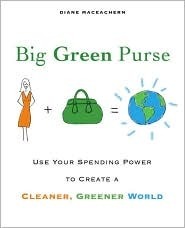 This book is the ultimate reference guide to teach us how to use our wallets to drive consumer demand for greener products. MacEachern's thesis espouses that when we start demanding better products, and we use our money to purchase them, we're telling businesses what we value and they will start providing what consumers want. I checked this book out at the library, but I will definitely be purchasing my own copy as a reference to use whenever I need to make a purchase from one of the categories above. For those people who think that environmentalism hurts business, they need to crawl out from under the rock they've been living in. Once upon a time, it was thought that if you were for the environment, you were against business. But now being Green is a business, and if you don't jump on the bandwagon, you're going to find yourself losing money. People are starting to understand the need to make more sustainable choices, and therefore, our purchases are beginning to be motivated by that understanding. I think fairly soon, we're going to see a paradigm shift (actually, the shift is happening right now as we speak). What was once thought as hurtful to business will become the status quo. Bravo to MacEachern for helping to make this shift all the more easy for consumers.